Have you ever climbed a rock wall? 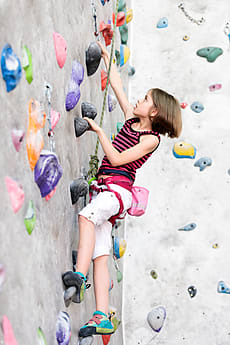 Some climb indoors, and others, outdoors. Wherever the wall might be it takes endurance, skill, and strength, or at least I imagine it does. I haven't tried it. When we think about every move we make, life is usually more predictable. Sometimes we take one avenue expecting a certain outcome, but we don't get what we expected. Life is unpredictable. How can we be ready when those precarious situations come our way even when we have taken every precaution? Every day, feed your spirit with the truth of God's word. Lies are everywhere, but when we are saturated with truth, we can stand in the storm. Every trial is an opportunity to grow closer to the Lord. This is one reason God allows trial in our lives. We learn His faithfulness. He is trustworthy, but if we don't have to trust Him we won't. Human nature wants to trust itself. This is one of the biggest lies of the enemy. Our nature wants to put us on a pedestal. It will place self in the center. When this is the case, everyone else is out of the picture. Selfish, self-centered people have no regard for others. Paul the Apostle writes to his church in Philippi, "my prayer is that your love may abound more and more," When Jesus is at the center of our lives, love abounds, because "God is love." Forgetting about self, only brings love forward. How do we love a selfish world? We need to see God's heart of love for them. 1 Corinthians 13:4 reads: Love endures long and is kind; love is never envious nor boils over with jealousy; is not boastful or vainglorious; does not display itself haughtily." Reading all of chapter 13 of 1Corinthians is eye-opening. Do you want to know what God is like? Read this chapter, verses 1-8.